Home Sweet Home for Crochet - Where crochet and fleece come together! This is a great scrap yarn project. MATERIALS: Worsted weight yarn, orange and black. BAG IS MEANT TO BE WORN AROUND YOUR NECK. SIZE IS 4 3/4" BY 4 1/2". 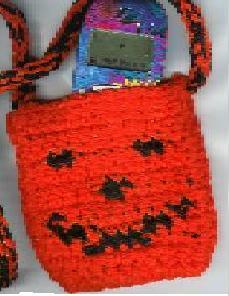 MY CELL PHONE IS VERY SMALL, PATTERN CAN EASILY BE ADJUSTED TO FIT YOUR PHONE BY ADDING EXTRA STITCHES IN ORANGE ON EACH SIDE. ROW 1: Chain 11. SC in second chain from hook, 10 SC made. Chain 1, turn. ROW 2: 2 SC in first stitch, SC across to last SC, 2 SC in last SC. 12 SC made. Chain 1, turn. ROW 3: SC in first four stiches, change to black. SC in in next four SC, change back to orange, SC in next 4 SC. 12 SC made. Chain 1, turn. ROW 4: SC in first two SC, change to black. SC in next two SC, change to orange. SC in next four SC. Change back to black, SC in next two SC. Change back to orange again, SC in last two SC. 12 SC made. Chain 1, turn. ROW 5: SC in first stitch, change to black. SC in next stitch, change back to orange. SC in next eight stitches. Change to black, SC in next stitch. Change back to orange, SC in last SC. Chain 1, turn. ROW 6: SC across with orange. 12 SC made. Chain 1, turn. ROW 7: SC in first five stitches, change to black. SC in next two stitches. Change back to orange, SC across last five stitches. 12 SC made. Chain 1, turn. ROW 9: SC across with orange. 12 SC made. ROW 10: SC in first two stitches, change to black. SC in next two stitches, change back to orange. SC in next four stitches, change back to black. SC in next two stitches, change back to orange. SC in last two stitches. 12 SC made. Chain 1, turn. ROW 13-15: SC across in orange. 12 SC made, chain 1, turn. ROW 1: With orange, chain 11. SC in second chain from hook and each chain across. 10 SC made. Chain 1, turn. ROW 2: Two SC in first stitch. SC in each stitch across to last stitch. Two SC in last stitch. Chain 1, turn. ROWS 3-15: USING ALLORANGE, NO COLOR CHANGES - SC in each stitch across. Chain 1, turn. With wrong sides facing, single crochet both pieces together around first side, bottom, and second side, leaving the top open. Using one strand of orange and one of black held together, chain 95. Slip stitch in each chain. Attach on each side of bag by placing handle on outside of bag and running a long strand of orange and black yarn through to inside of bag and tying several times.